I’m not a huge chocolate person, so naturally, it never crossed my mind to make chocolate truffles. 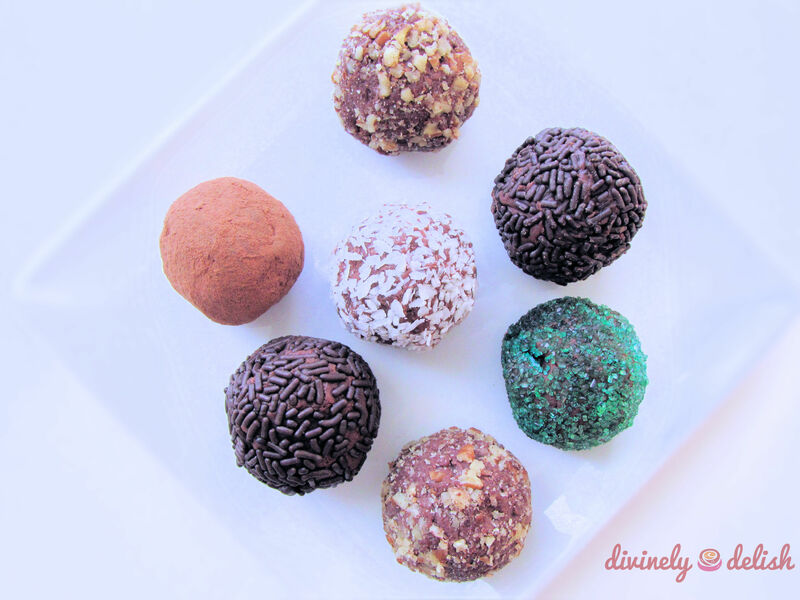 But recently, I discovered just how easy they are to make and, with Christmas coming up, I decided to try my hand at making some pretty little truffles that I could give as gifts. On the rare occasion that I do eat chocolate, I tend to prefer the less sweet, dark variety. So first I tried a dark chocolate truffle recipe. It probably would’ve been ok except that the recipe called for rolling the truffles in unsweetened cocoa which, while perhaps more traditional, made the truffles way too bitter, even for my liking. I was pretty sure these truffles wouldn’t be too popular among my friends, so I searched for another recipe. 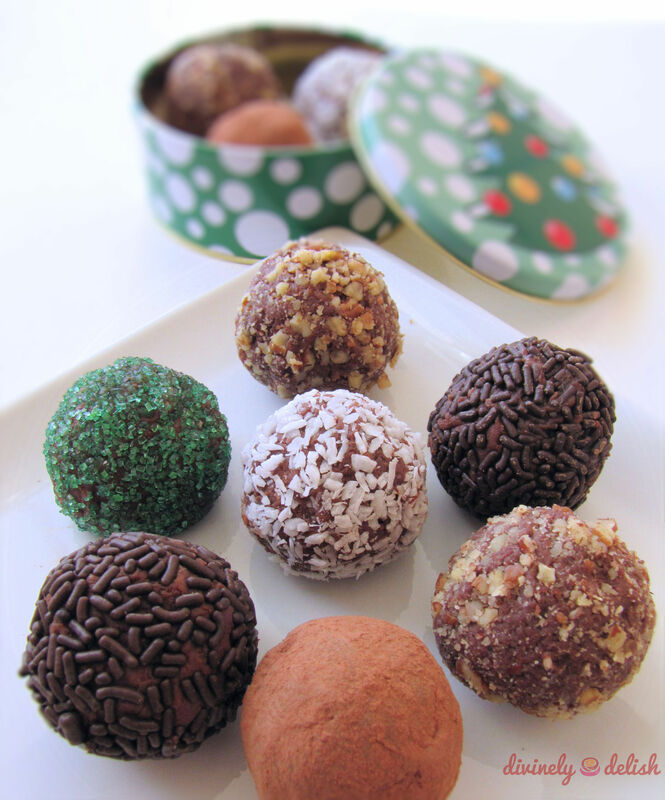 Those with a sweet tooth will surely enjoy these milk chocolate truffles. They’re super rich though, which may be a good thing, because it means you can’t devour too many at once! You can’t really taste the Kahlua though, so I’d suggest adding in 3 tablespoons of the liqueur instead of 2. You can play around with the coatings – chopped toasted nuts, unsweetened dessicated coconut, unsweetened cocoa powder, chocolate sprinkles, coloured sugar crystals -whatever your heart desires! 1) Stir chocolate, cream and espresso powder in the top of a double boiler set over simmering water, until smooth. 2) Remove from over water and whisk in Kahlua. Cool 15 minutes. Refrigerate 1 to 2 hours, until mixture is no longer runny and has the consistency of cookie batter. 3) Line baking sheet with foil or parchment paper. Scoop out tablespoon-sized mounds of mixture (I weighed out 30-gram mounds)and place on baking sheet. Place the baking sheet in the refrigerator for a further 30 to 45 minutes, until the mounds are firm enough to be handled. 4) Using your fingers, gently squeeze each mound into a rough ball shape, and then roll between the palms of your hands into smooth balls. 5) Roll the balls in your choice of coating(s). Note: Store truffles in an airtight container in the fridge. They’re best eaten at room temperature, so take out and let sit at room temperature for at least an hour before eating. Truffles can be kept for up to one month in the refrigerator.